Super clean winch equipped M928a2 long wheelbase 6x6 cargo truck. Long 215” wheelbase with approx 20ft of usable frame with a factory double frame. Hydraulic 20,000lb rated front winch. This is a great chassis for multiple heavy duty uses. Cummins 8.3 liter C series turbo diesel with desirable in-line Bosch injection pump. Allison MT654CR 5 speed automatic with 2 speed Rockwell transfer case. Shift on the fly front wheel drive when needed. Full air brakes with ABS. 90%+ tread virgin tires including a mounted spare. Truck is gone through and is ready to work. We can install a cargo cover, remove bed, paint your color of choice, export, etc. $25,000. 6x6 Semi Tractor model M931a2 which has gone through a complete government depot overhaul. Cummins C series 8.3 liter diesel engine with mechanical inline injection pump. Allison MT654CR 5spd Automatic transmission. Two speed Rockwell transfer case with air shift front axle allowing shift on the fly for when front wheel drive is needed. Heavy spec 18k front axle and 44k rear spring tandem suspension. Heavy duty tried and true Rockwell double reduction axles. Power steering and full air brakes with ABS. Heater kit is included. Insulated steel hard tops available. Multiple units available. Gone through our shop and ready to work. $19,500. Fresh Rebuild M923a2 6x6 Cargo Truck. Heavy spec 18k front and 44k rear tandem with double reduction Rockwell axles. Cummins 8.3L C series turbocharged Diesel engine equipped with inline mechanical Bosch fuel pump for ultimate durability. Allison MT654 5spd Automatic with 2 spd Rockwell transfer case. Air shift switch on dash for engagement of front wheel drive when needed. Ross power steering makes for easy turning. Full air brakes with ABS upgrade. Tires are 90%+ tread with spare being brand new. Cargo bed is 14ft in length with drop sides for ultimate versatility. All trucks equipped with heater kits. We can install hard tops, dual tires, paint to your needs, stretch trucks, etc. We can export! $20,000 each. Fresh Government Rebuild M923a1 6x6 Cargo Truck. Large 3 man cab. Heavy spec 18k front and 44k rear tandem with double reduction Rockwell Axles. Proven Cummins NHC 250 855ci Diesel with Allison MT654 5spd Automatic Transmission with 2spd Rockwell transfer case. Air shift switch on dash for engagement of front axle when needed. Ross Power steering makes for easy turning. Air brakes with ABS upgrade. Excellent 90% plus tread Michelin all terrain virgin tires. Spare tire is brand new on all trucks. Versatile 14ft dropside cargo bed can be easily converted to a flatbed if needed. All units have heater kits. We have 3 of the green units and 7 tan units in stock. We can stretch frames if needed, install larger single tires, duals, hard tops,paint to your needs, etc. We can export! These are as clean as they come! $20,000 each. ... Government Rebuild in 2005 with only 21,707 miles showing. 20,000lb hydraulic front winch. Large 3 man cab equipped with insulated hard top and heater kit. Heavy spec 18k front and 44k rear tandem with double reduction Rockwell Axles. Proven Cummins NHC 250 855ci Diesel with Allison MT654 5spd Automatic Transmission. Air shift switch on dash for engagement of front axle when needed. Ross Power steering makes for easy turning. Full Air brakes with ABS upgrade. Good Year 1400x20 at 85%+ tread. Super singles provide excellent traction and pulling power off road. Spare tire is brand new and still has mold marks present on tread. Versatile 14ft dropside cargo bed can be easily converted to a flatbed if needed. Truck is mechanically and structurally in excellent condition. $21,500. Multiple M925's in stock. M931a1 6x6 Semi Tractor Gov't rebuild in Dec 2008! ... M931a1 6x6 Semi Tractor Gov't rebuild in Dec 2008! Less than 5,400 miles of use! Truck is tagged December of 2008 for gov't rebuild. Large 3 man cab. Heavy spec 18k front and 44k rear tandem with double reduction Rockwell Axles and 2 spd Rockwell Transfer case. Durable 855 cubic inch Cummins NHC 250 diesel. Smooth shifting Allison MT654 5spd Automatic Transmission. Air shift switch on dash for engagement of front axle when needed. Ross Power steering makes for easy turning. Air brakes with ABS upgrade. Excellent 90%+ tread virgin Michelin XL 1400x20 all terrain tires. Late model rebuilds with low miles and hours-some under 50 hours. Large 3 man cab. Heavy spec 18k front and 44k rear tandem with double reduction Rockwell Axles. Proven Cummins NHC 250 855ci Diesel with Allison MT654 5spd Automatic Transmission. Air shift switch on dash for engagement of front axle when needed. Ross Power steering makes for easy turning in demanding applications. Air brakes with ABS upgrade. 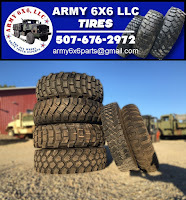 Excellent 90% plus tread Good Year all terrain virgin tires. Spare tire is brand new on all trucks. Versatile 14ft dropside cargo bed can be easily converted to a flatbed if needed. All units have heater kits and some have insulated hard tops. We have 5 of these units in stock and can stretch frames if needed, install larger single tires, paint to your needs, etc. We can export! These are as clean as they come! $20,000 each. Heavy specification 6x6 wrecker truck with less than 5,000 miles showing. Cummins NHC 250 diesel power with Allison 5 Spd MT654CR automatic transmission. 2spd Rockwell Transfer case. Full air brakes. Heavy spec 18k front and 44k rear axles. Front winch is rated for 20,000lbs and 45,000lb rear recovery winch. Crane is rated to lift up to 20,000lbs and extends out to 18ft. Crane rotates 360 degrees. Unit equipped with 1400x20 super single tires for maximum traction. We have personally used this wrecker for the last two years for various shop tasks and it's a very structurally sound and strong running unit. Truck is ready to work. $25,000. Insulated Hard top and painting available.